Finally, two weeks in a row with Clean With Passion for Now airing like a normal television show. I think this episode might be full of tears, but still, at least they are on-air tears. We open with that super long kiss. Osol and Sungyeol laugh a lot at breakfast and eat as she wears his shirt looking disheveled and he looks like his normal well put together self. He happily tries to get the bread that is in crumbs all over here off her face and the milk as well. He happily wipes the milk off her face but then kisses her quickly. She asks what he is doing. he point to his lips to give him a quick kiss as well. But then she gets a text saying that she is going to get it. it is a text from Odol. She gasps and then thinks that she forgot to call her father. She hurries to change and then runs out. SG says he can drive here there but she says that her father will kill her if he knows she was with him. Fighting! She runs off. Cut to her sneaking into the house. it is empty but then Odol comes out and chastizes her about not coming home overnight. She asks about appa. He is angrily chopping fish with a huge knife. the head pops off. Appa – Where did you spend last night? Osol – I was with Joo-yeon! Of course! Odol calls Joo-yeon and asks if her sister slept over there. Joo-yeon plays along. OF COURSE, we had chicken and beer, she didn’t call you? Joo-yon saves the day. Appa is upset but fine. He tells Osol to wash, he is making Goldenwae. Odol tells Osol that she is dating and doesn’t think, she needs to get real. Osol is able to sneak away and call Sungyeol. He says he needs to buy something nice for Joo-yeon. It seems like it is not the first time you did not go home. They playfully joke. he blows her a kiss over the phone and the three cleaning guys see him. They all think that is amazingly gross. Later on, Choi talks to one of his doctor colleagues who asks him if he is staying longer? She says that they want him to stay there if he wants. he thanks them but says he isn’t ready for that. She asks if he is going back to America? She does not want to lose a talent like him. He thanks her again and then asks for a favor when he sees Chairman Cha going up the elevator. Elsewhere, Osol meets with Joo-yeon, she asks them what they did all night? You know, after the movie. Osol tells her it is not like what she thinks. Joo-yeon tells her that she owes her big, you have to pay me back. osol hugs her and tells her that sheh loves her, she is so smart, who else loves you this much. But then she notices Odols taekwodno pendant and wonders why Joo-yeon has it. She says she will give it back to him. Joo-yeon mentions that he dropped it and she will give it back to him. Your late anyway. Osol smiles and says that CEO will be waiting for her, she happily hops off. Sungyeok is at ta playground and sees Osol looking for something with a lot of little kids on a playground. They are looking through the sand for something. SG tries to get her attention. But she is looking for a tooth/teeth. A little kid lost his two front teeth and is trying to find them to brag about it. the little boy shows his teeth and asks SG if he is the boyfriend. SG smiles and thinks about playing on the playground a long time ago. They find the teeth so the kids run off. SG tells Osol about playground trauma when he was little. A little girl threw a booger into his mouth when he was little. Osol laughs. She wonders if his germaphobia started with that? He says he is serious. She tells him that she has a similar memory, she still remembers it. There was a guy with shiny shoes that told me to play with him, so I threw a booger and it went into his mouth. He passed out! I did mouth to mouth though, so he surivived. He really liked me. After that he came everyday and looked at me. Maybe he was very shy. SG – it is not like he was shy, maybe he was afraid. Osol – I remember his cheeks got red because he liked me so much. SG – How was the doll you carried everyday? Osol – How do you know that? Where you the boy?! Osol – Daebak! Wait, so you really didn’t like me? Where you afraid of me? SG – I think I liked you. Osol goes home and looks at her old doll. She wonders if this is really fate? She happily hugs her doll and then takes a selfie to send to Sungyeol who is in bed as well. He looks at the selfie and smiles. OS: The booger girl is sleeping now. Good night shining boy, no nightmares. he goes to sleep and hugs his pillow. But it isn’t enough. He looks at the photo again and thinks that she is super cute. Osol happily cleans her room with hearts and love. She cant believe how much stuff she has under her bed. She starts to pack things away and organize. Her father and brother look at her amazed and wonder why she is like this, did something happen? Choi comes in and asks whats up. Appa tells him that his daughter is cleaning, I’m scared. he hides behind Choi. Later on, Choi helps her clean her clothing by adding hot water to the wash. he tells her that it is good to see her smiling, he hopes she is always happy like this. his advice is to not be discouraged by whatever happens. Later that night Osol calls SG to brag about the skills she learned from his cleaning fairy company. She used it in her own house. She did not know that her room was this big. She realized that cleaning is a good thing like this and thinks that she changed a lot after meeting him. he tells her that she is perfect the way she is, there is no better Gil Osol to him. She explains that his mom said, do to what happened before, she can’t visit him. He says that is good, it is uncomfortable. But Osol says that he should get close to her at least once. Cut to his mother telling her boyfriend and another man were to put a huge mirror. SG walks up to her and tells her that he needs clothes. They go sit. SG tells her that her store is cooler than expected. Maehwa is so happy to hear it and says that his mom did everything, the design and clothes and everything. He tells her that he will see it. She runs off and grabs her book to show him. She has his drawings when he was little. he said that people complimented his drawings. She was thankful that he grew up well. She heard that he is dating Osol, she likes her. Osol is bright and not easily timid. Would you like to go to a resort together? I will tell them to sanitize everything. He says it is okay, dating outside the house is hard. She asks if they only go on dates at home? Really? Sungyeol thinks about that. Later on, Osol and Sungyeol sit and chat together. She is happy that he saw his mother. He kid of pretends like it is no big deal. But she pats him on the bottom and tells him that he did a good job. She asks if he would like to watch a movie at home? It is open in the theater now. But he says that they can go out and watch it. he really awnts to watch it, so lets go to the movie theater! They head out to the movie theater. it is super empty inside. Osol sits and applies cosmetics as she waits. Then Sungyeol shows up. he already bought the tickets so he tells her they can buy popcorn. She goes to the counter and SG talks into his jacket as if giving someone a signal. 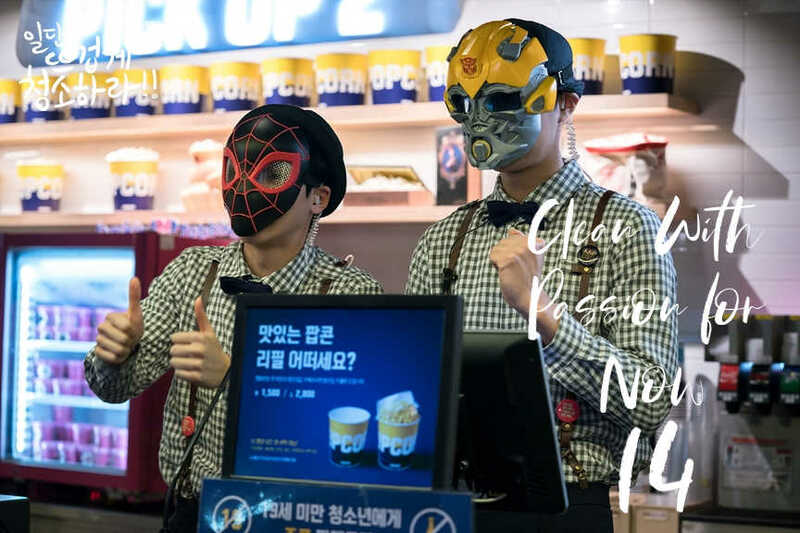 the two poeple behind the counter are wearing masks and trying to prepare the soda and popcorn, but they clearly don’t really know what is going on. it looks like it is Dong-hyun and Youngsik. They walk off. Osol says that the workers are strange. One of them sounded like Youngsik. they awlk up to the other worker to give their ticket. This guy is also wearing a mask and is jaemin. Jaemin is his exuberant self so Sungyeol mouths that he is going to get him afterwards. They go into the movie theater, it is empty. SG says that everyone else must have thought that it was canceled. The movie they end up seeing is the one with So Ji Sub and Son Yejin. They happily watch. Afterward, osol and SG drive off. Osol says that it was fun to go to the movie together, would you like to go to a concert or baseball game later? Sungyeol thinks that if she wants it then he can try. She smiles, but he looks worried about it. She thanks him and tells him that he doesn’t have to try to hard. he doesn’t have to rent the movie theater and clean it and stuff. He is all like, really? She tells him that it is the weekend and there are no people in the movie theater and it had a Clorox smell, I know that smell well. He is happy that they got to hold hands and go to the movie together. he wanted to go on a normal date. He looks at all the couple outside kissing and holding hands and walking together with hearts all around. He thinks she has a hard time being next to him. He says he shouldn’t be like that. Just having him around is enough. Choi meets with SG later and asks him to fix his germaphobia. Choi asks him if he has the will to change himself? SG says it is uncomfortable recently now. He didn’t really think about it before. Choi asks for the reason, he was okay before but now he isn’t. Why? SG answers that it is because of Gil Osol. That is why he wants to change. he has a lot of things he wants to do with her. Choi says that is a good that he wants to change, so now – you will do anything I want you to do? I will take it like that. Sungyeok cowers a bit, um….anything? Choi says OKAY, lets start right now. they end up leacing right away and are wearing the same white jackets in the car. CHoi tells him that they are going on a trip for treatment. Or he can also call it training. In the city, Osol helps her father cleaning cars in the parking lot. he tells her that she has to do a very good job. She tells him that they should eat Udon afterward, he is all like, now I know why you wanted to help me today. Drinks afterward? Let’s go! In the woods somewhere, Choi tells Sungyeol that they are sleeping at this resort. He happily dances off. Osol pleasantly eats with her Dad and tells him that she will clean the house regularly now. He thinks she changed completely after dating. She says she hasn’t. He asks why her ears are so red then? he smiles and says that he likes that she changed, he feels more relieved. He wonders what she will do now, she needs a plan. She says that she wants to help her dad from today. Then she will find what to do after a bit of time off. After i quit the competition, I never really thought of what I want to do. Ii thought I would get an okay job but I don’t want to be like that anymore. I want to find what I really want to do and have fun in life. So even though it is slow, I will do it properly. He smiles and says that her mother would like it. They both happily think about her mom. Osol asks why he put the flowers and yogurt at the memorial alone, he should have waited for her. But appa says that he actually hasn’t gone there for awhile due to being too busy. He needs to go soon. In the mountains, Choi and SG talk outside around a fire. Choi tells him not to make him regret giving up Osol for him, he hopes he protects her. If he does not give up then everything will be okay. SG says that he doesn’t need to worry about it, he will protect her. That is why he came there. So, is that okay? SG mentions that he will do it, he will try. In the Chairmans office, the chairman asks for the list of the people for the disciplinary committee. Gwon tells him that she will not be able to work for the chairman anymore. She does not want to do things that the CEo does not want. And she hopes that he will not bother Gil Osols family. She quit, so he should not get involved with them anymore. He says that he heard that Sungyeol is dating her. Gwon tells him that it is between them, not you. He wants to know why she did not tell his mother that she is the victim of their city renovation? he will continue to care for Sungyeok his own way. he thanks her for a good job. Joo-yeon gives Odol back his pendant and tells him to give it back to her when he gets his medal. She also tells him that she will only accept the gold. He is so happy that he runs off to his Taekwondo people who all happily hop around to celebrate. She quietly answers the phone and heads outside, but he shows up in front of her while she is still inside. He tells her that he opened the door with his bear hands, he had special training. She asks if he is okay? He says that he thought this much was okay, but actually it is a bit difficult so he thinks he might have to leave soon. She happily pulls him outside. They spend a nice amount of time in front of the balloons as he warms her face with his hands. they kiss a few times and hang out outside together as they hug and kiss and hug and kiss. Elsewhere, Choi thanks Gwon for the CCTV footage. She apologizes. He says that he wondered who she was helping. She says that to her, the CEO is the future for her son. She wanted the best for Sungyeol, but she made it worse. She thinks the disciplinary act will be difficult because the chairman nows about Osol now. Also, Osols mother is the victim. 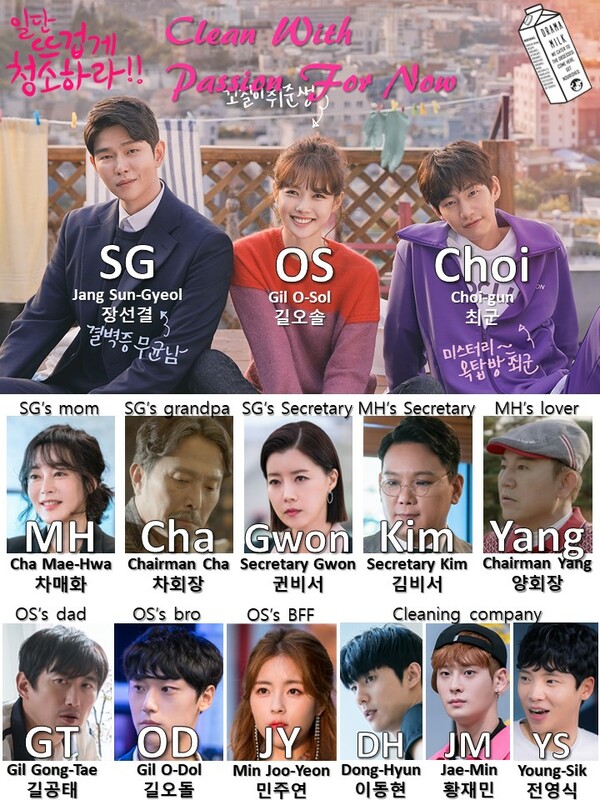 The chairman thinks Osol and the CEO should separate so he wants to affect the family. Choi sees Chairman Cha next. He tells him that he heard he does not have more than 3 months to live. I heard you did not tell your family members because you have not decided who the next owner is. Cha asks if he is threatening him. Choi says yes, that is true. Cha asks what he wants? Choi tells him not to touch Osols family. 6 years ago you made a bad decision where 4 people died. I know that you know Osol’s mother is one of the victims. You didnt’ even apologize but not you are doing it again. i should do worse than you than these threats. Sungyeol talks to Osol about the disciplinary hearing. She is not worried because the result is already there. He wonders if they should have a celebration party at his place. She realizes that it is raining and runs outside the get the clothing. She will call him back later. But when she goes to the roof she realizes that Choi took the clothes off already. They end up drinking tea together. Choi asks why she did not go to the disciplinary hearing, Osol says that she isn’t concerned about it, she is just happy that he will get a chance to compete again. Osol wonders if Choi is the person with the yogurt that visits her mothers site. He says that he is that person. She wonders why? He says that she gave him a yogurt once before. Flashback to her giving him a yogurt. VO – that yogurt was comforting to me also. I recieved comfort but you didn’t so since then I was concerned about you and your family and wondered if I could stay next to you guys. I wondered if I could help you all, no matter what it was. Osol is stunned to hear this. In the disciplinary hearing, Odol is given a one year suspension. Appa and Odol are shocked, it was self defense. Odol is upset and sad. Appa thinks that it might be a mistake, they can talk to the coach. In the background they hear someone talking about how his sentence was too harsh, what is the deal with him and AG group? Is is because his sister is dating the Grandson? Odol walks up to them and wants to know what is going on. Appa tries to pull away. In the house, Osol looks at her cactus that has hats on it and then hears that her brother and father are back. She takes one look at them and wonders what happened? Things didn’t go well? Odol goes to his room. Appa is sad and wonders why it has to be him? Did you not know that he is AG’s grandson? Why is he part of that family? The family that killed your mother. This is news to Osol. Is the CEO an AG person? It shouldn’t be. How can this be? Appa says that they killed her mother and are now trying to screw up her brothers life. Osol takes this all in. In his house, SG looks at a necklace he bought for Osol. She comes over drenched from the rain and tells him that they need to stop dating. Lets break up. SG – What are you talking about? Did something happen? Just come in first, it’s cold. Osol – I told you that we should break up. SG – Why? You were okay until this afternoon. Did I do something wrong? If it is something wrong, if you are angry, then I can change or do anything. How can you say thta we should break up? Osol – nothing is wrong with you, I just hate everything. I can’t see you anymore. Let’s stop here. She leaves. He takes a few deep breathes. She leaves and cries at home. Sungyeol tries to call Osol but she does not recieve it, she also does not answer his texts. he leaves another message. SG – Gil Osol, lets talk, just pick up the phone. Osol listens to her messages as she lays on the floor of her room. She listens to SG’s message but erases it and flips her phone over. Then she thinks about her mothers funeral at the site. During the funeral, the CEo showed up which caused everyone to try and get to him to yell at him. Appa gets to him and calls him a murderer. But he gets thrown to the side. Osol thinks about this while lying in her bed and looking at her photos or her mother. She starts crying. Her father checks up on her and tells her that he will go to work. He hopes that she eats something and tells her that she also shouldn’t make him sad like this. But she covers her head. So he leaves and immediately runs into Sungyeol. He walks by. Sungyeol is clueless. Appa tells him that he is not his abonim, never come to my house anymore and never come next to Osol anymore. He leaves. Choi comes out as well. They end up going somewhere to talk. SG – I feel like I did something very wrong to Osol, but I don’t know what. i want to apologize to her, but I don’t know what I have to apologize for. I text her and call her but she does not respond. There are so many days I cannot even work because I worry about her. Is she at home? Is she sick? Choi tells him that he should wait for her, it is good for him and for her. But he wonders why he should do that? I say her father, he looked so upset, I don’t know why he is like that. Elsewhere, Osol walks helplessly around. She runs into Sungyeol talking to Choi. She is stunned to see him, he runs to her and they stare at each other for a moment, then she turns to walk away. Really just waiting for this drama to end at this point. I feel like I can predict pretty much everything that is happening. I hope it can maintain its airing slot for the last two episodes finish! SG – I don’t need anything. A doctor or curing my germaphobia…I am not doing it. MH – Abogi, you made Sungyeol like that! You did it! Osol – I am not going to run away or avoid it. I have to see the CEO now. I still find the actress’ young age makes me squeamish, but I’m here for the story. And since I’m here for the story, if they don’t deliver an accidental pregnancy and SG having to deal with messy children, I don’t know what the writers are even thinking. Same here, the super long kiss had me like 😐. We had to fast forward through that. I love the cleaning team, though. We didn’t have much of them this episode.